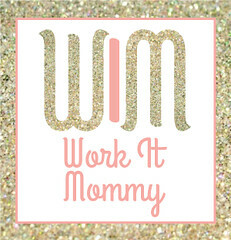 Back in October, Beth at Our Pretty Little Girls, Whitney at Work It Mommy, and Becky at BYBMG and I started sharing different fashion themed posts. First it was how we styled our utility vests, then it was all about plaid, and our most recent was our winter accessories. We are back today, but this time we are mixing it up a bit. 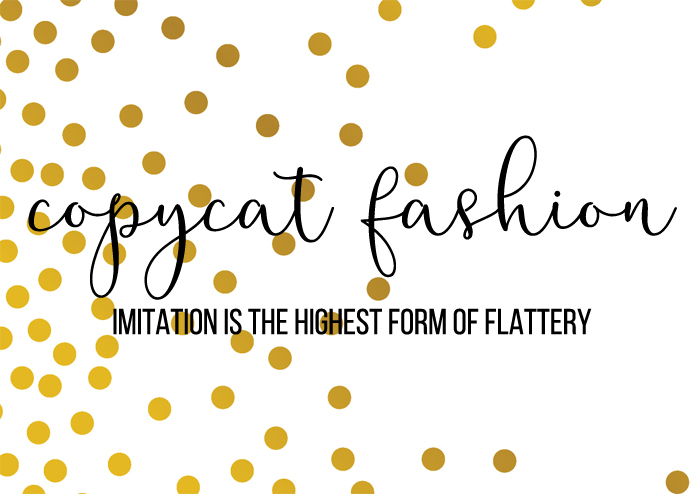 Since I am constantly getting inspiration from my fashionable friends, I loved Whitney's idea to do a little "copycat" fashion post. Between the four of us, we will be copying an outfit that each of us have posted in the past. I was assigned Beth, and right away I knew the outfit I wanted to copy. When she posted this outfit, I loved her mix of patterns. 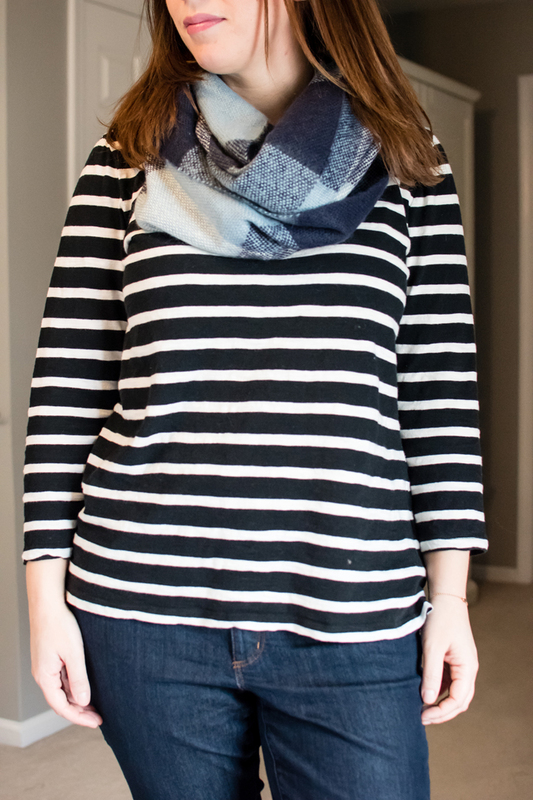 While I own a few striped shirts and many plaid scarves, I don't think I've ever worn them together. I wouldn't describe myself as being scared of patterns, but maybe I am... or rather was. 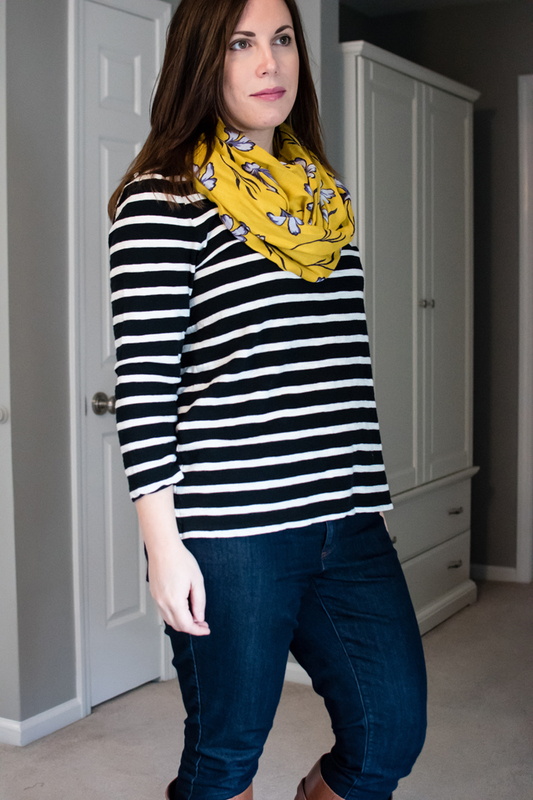 The best part of this outfit is that I didn't feel the need to copy her exact pieces, it was more the idea of combining stripes and plaid that I loved! As I was going through my closet, I was surprised to find out that I don't really have any plaid scarves with black in them. And yet, all my striped shirts are black! So in addition to mixing patterns, I also went out of my comfort zone and mixed navy with black. Part of me felt like I was committing a fashion faux pas, but I actually like the look of it. 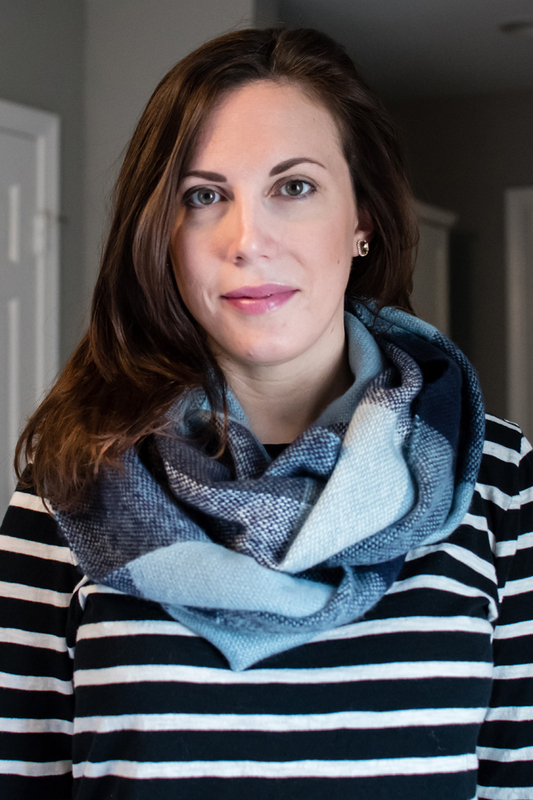 I think the fact that this scarf has multiple shades of blue helps a lot! 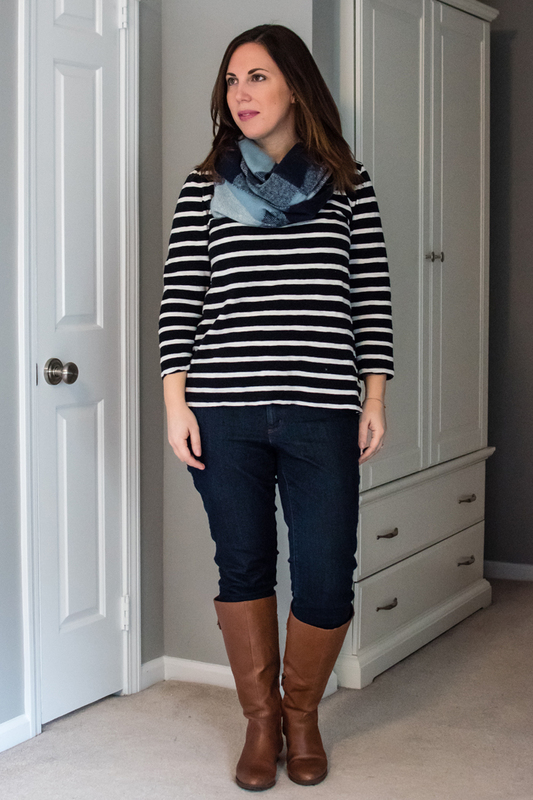 Just like Beth's original outfit, I love how this is a casual outfit that is easily elevated with accessories. Dark denim, brown riding boots, and some sparkly earrings, and I had a comfortable outfit that was also stylish. Perfect for a weekend birthday party! As I was putting this outfit together on a cold and windy February day, I couldn't help but dream of Spring. Just the day before it was almost 70 degrees and I was running errands in short sleeves! While I can't count on that kind of weather (at least on a regular basis) for a few more months, I can make it feel like spring with my accessories. 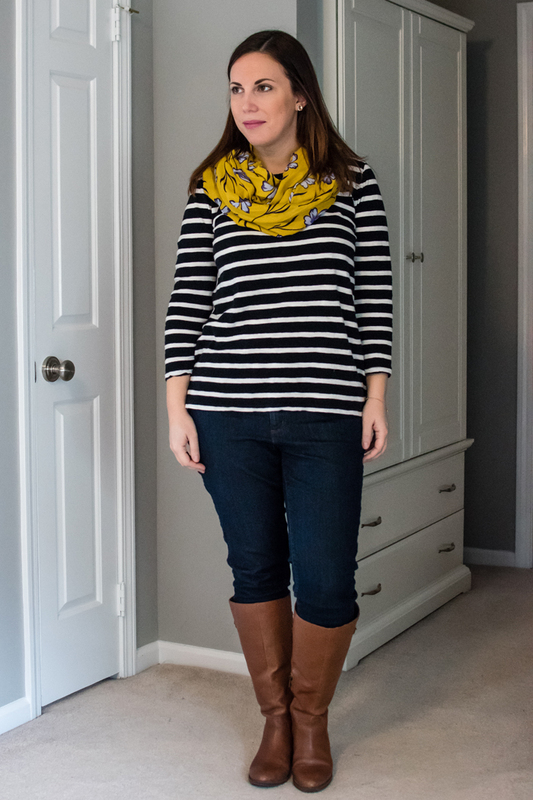 I've been eager to add something mustard to my wardrobe so I was thrilled to get this mustard scarf for my birthday. I couldn't wait to start styling it with different outfits! 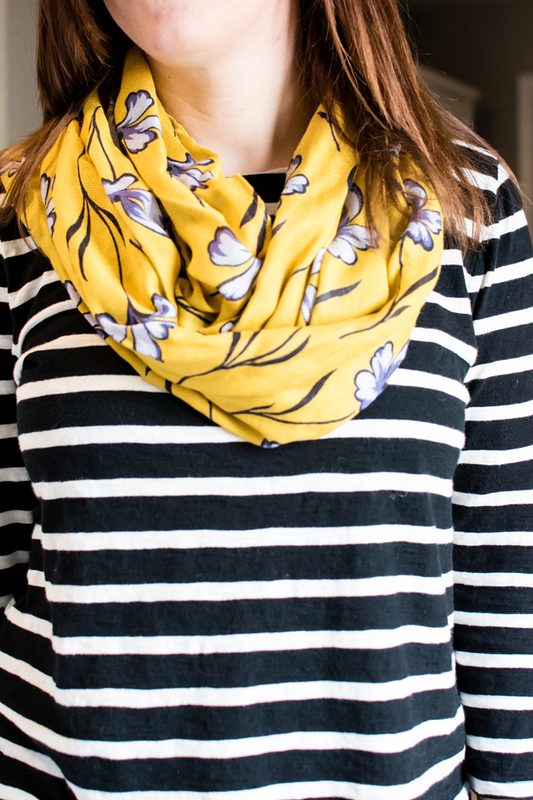 I simply swapped the navy plaid scarf for this mustard floral scarf, and it's amazing how one change could change the feel of an outfit. I went from winter to spring with the switch of a scarf! So tell me, how did I do at copying Beth's outfit??? Do you like getting fashion inspiration from your friends? I'm always excited to see what Becky, Beth, and Whitney came up with, but especially this time since one of them will be copying one of my past outfits!!! LOVE it!!! That I think I love that floral mustard print even more than the plaid... so you know what I'll be shopping for. 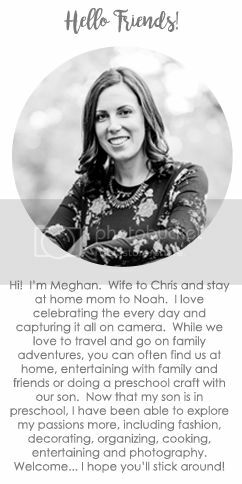 You did a great job Meghan! This post was so much fun to put together. We should pick another theme soon! Love it! I agree with beth that I think I love the mustard scarf more than the plaid!! 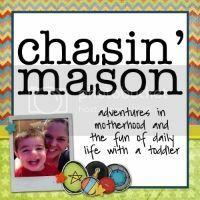 This is such a cute post idea! I love it! The mustard is so pretty with that outfit. I love your take on Beth's outfit! Now I think I can totally pull that look off myself. Thanks for the inspiration! Love the style you chose to go with and I love your take on it! 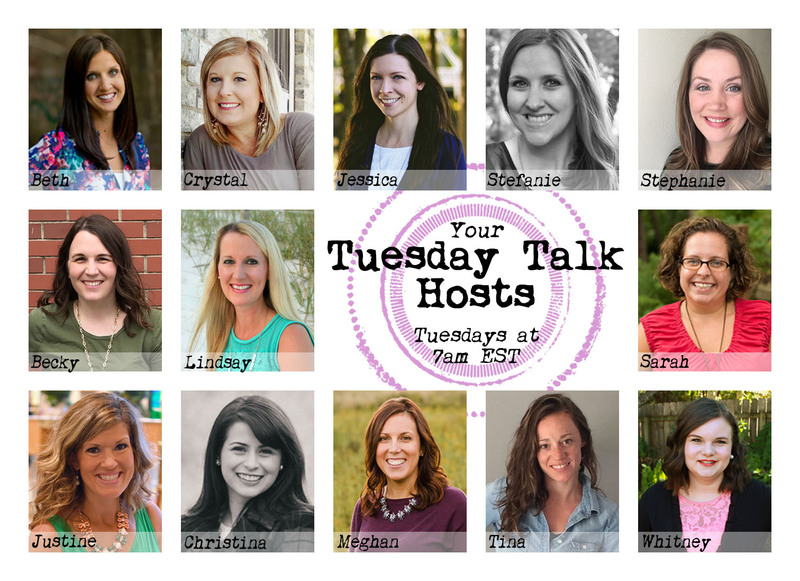 This blog hop is so fun! Your mustard scarf is gorgeous! Im pretty sure Beth has paired stripes and mustard too lol. But in all honesty you cant go wrong with stripes. Such a fun idea! 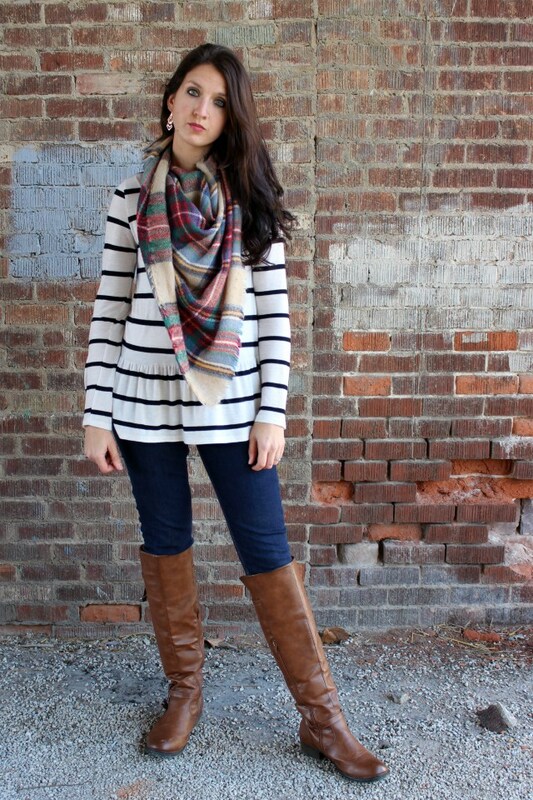 I love the print on the scarves with the stripes! Love this!! Those scarfs are great! I loved her outfit and I love your "copycat" of it. But I have to agree with everyone else... I love the mustard more too! 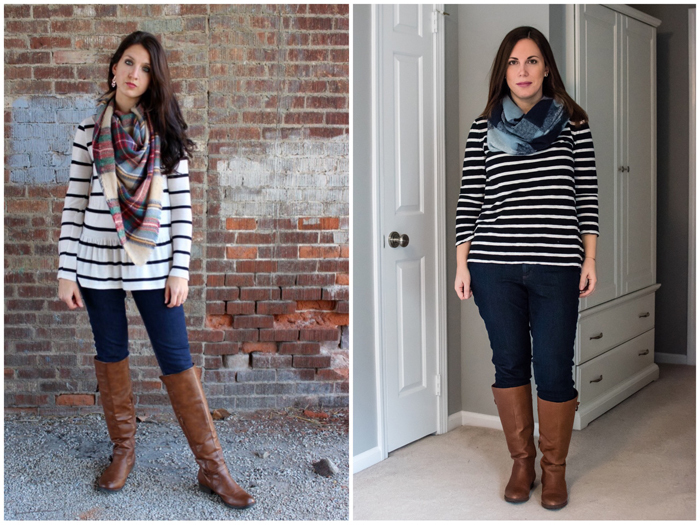 I love the idea of you ladies recreating an outfit! So much fun. I also love the pattern mixing! You ladies do it so well.